I was like a kid anticipating Christmas this morning when I grabbed my life jacket and headed out the door for the Maine Audubon Loon Count. While sipping coffee on the porch earlier, I’d heard a couple of hoots come from the middle basin. 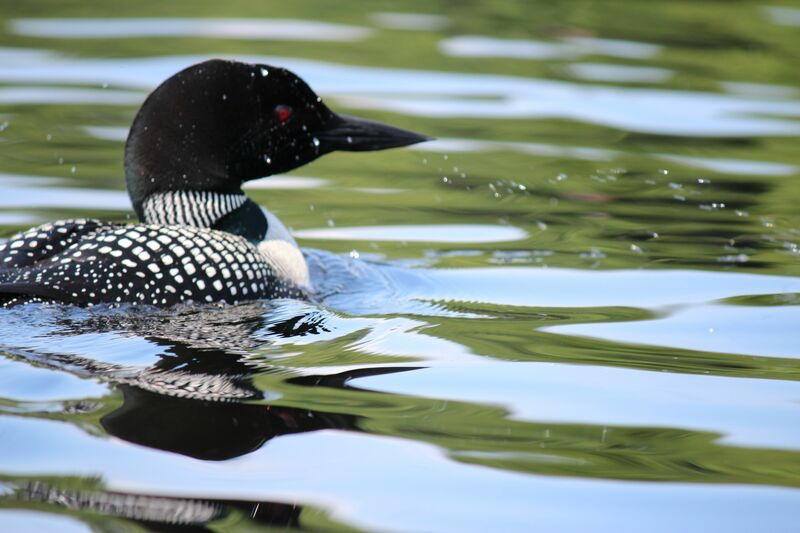 The hoot is the call a loon uses when it wants to announce its presence or locate others. This is my first year participating in the event, which occurs annually on the third Saturday of July. 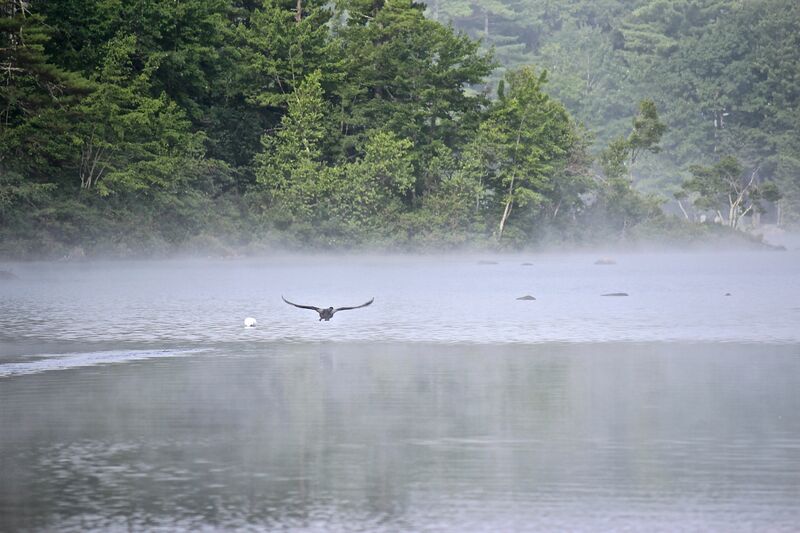 It was misty when I slipped the kayak into the water, but I decided to bring my camera along just in case. 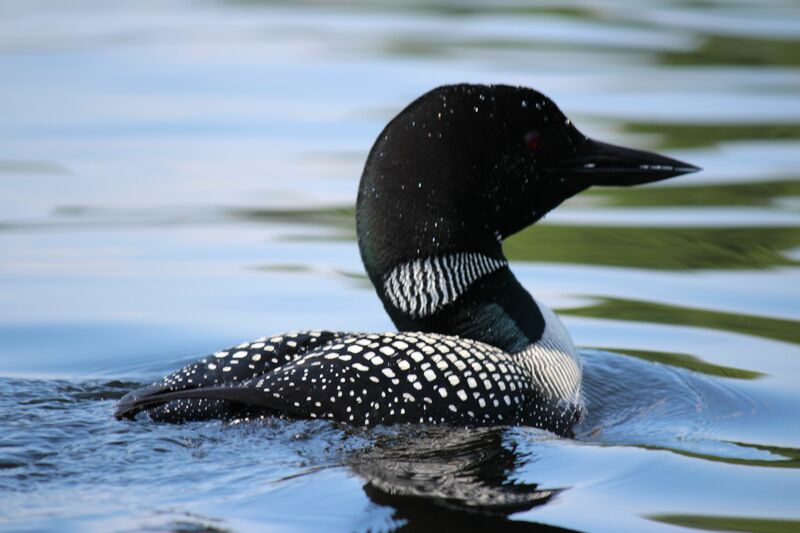 The count traditionally begins at 7am, when about 900 volunteers across the state gather data about the status of Gavia immer, the common loon. As I approached the causeway to begin my tour of the western side of the upper basin, I heard a quiet motorboat behind me. My fellow counter, P.B., and I chatted briefly and then decided to meet about a mile and a half to the north and compare notes. The breeze was with me making for an easy paddle as I scanned the water, looking for that iconic bird that resembles no other on our Maine waters. I saw four ducks. And four fishermen. P.B. and I met up as planned and had the same results. 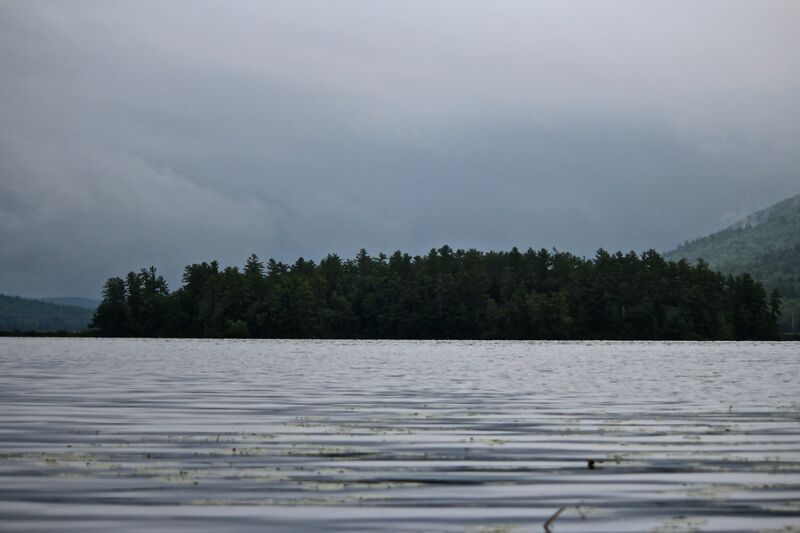 No loons this morning, though during the week we’d both seen a pair and a single loon diving. 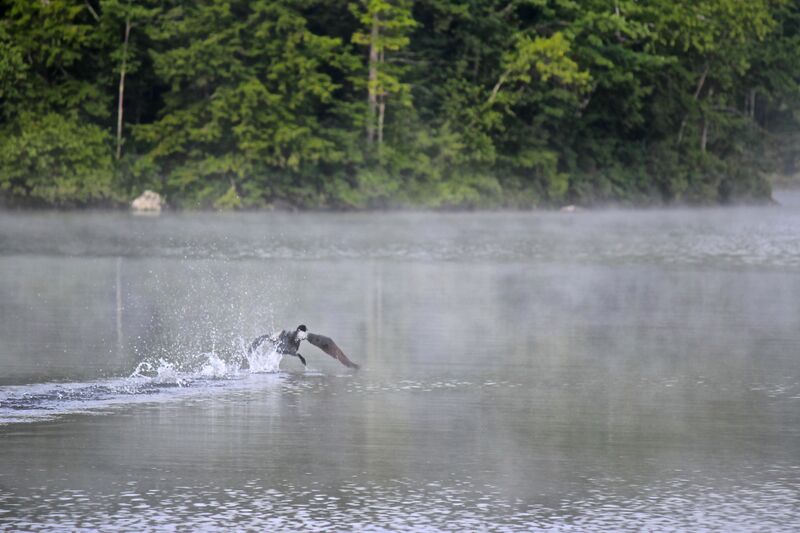 For those of us who are looney about loons, we had great hope for the nesting couple on the upper basin this year. Last year, for the first time in a long time, they successfully hatched two chicks and raised one. We learned from another observer (S.F. ), who has been a long-time Audubon counter, that the second chick somehow managed to make its way through the middle basin to the lower basin and joined another family raising one chick. An amazing feat to be sure. These are last year’s chicks–about two days old. This year, one chick hatched on July fourth, was seen by some (not me) for a couple of days and has not been spotted since. And the second egg apparently half-hatched. What happened to the first chick and why did the second die? We don’t know. We do know that boats were harassing the young family. 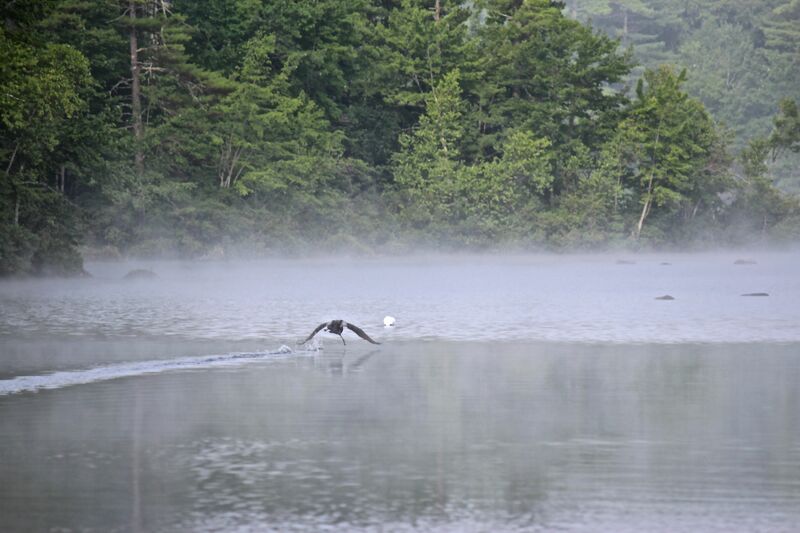 But we also know that turtles and eagles and other predators exist on the lake. And it was Independence weekend. Could fireworks have had anything to do with the loss of the second chick? The loons were certainly not impressed with the noise that night as was evidenced by their tremolo alarm calls. Back to this morning. 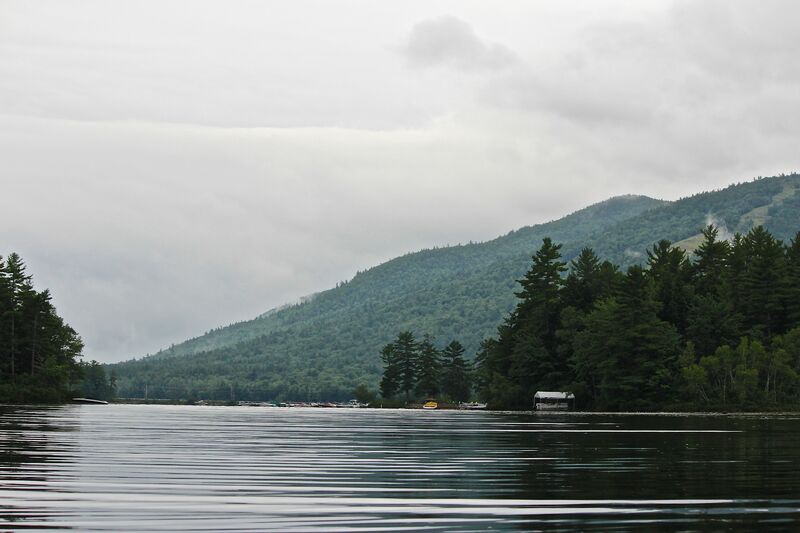 The clouds thickened as I paddled home. It was a gentle sprinkle at first. Then the wind picked up and it rained a bit harder. But . . . 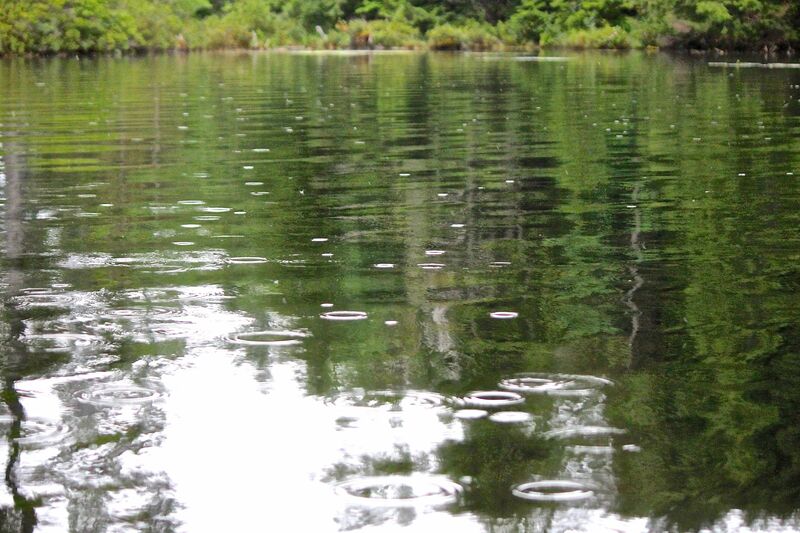 I could hear a loon, so I paddled frantically while scanning through water drops. Eyeglass windshield wipers would be a great invention. Not a loon in sight. 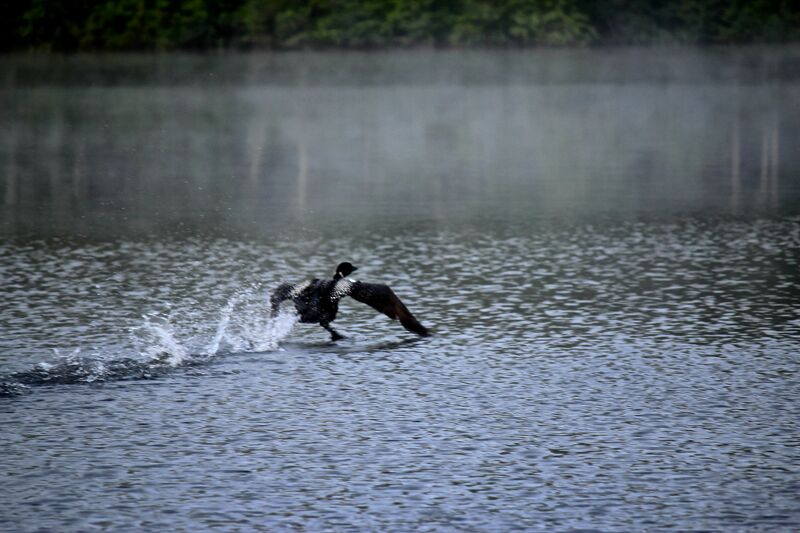 I did enjoy breakfast with a few of the hearty volunteers (thanks S. & H.) and learned that one couple saw at least five loons and one still sitting on a nest that traditionally produces chicks at a later date. 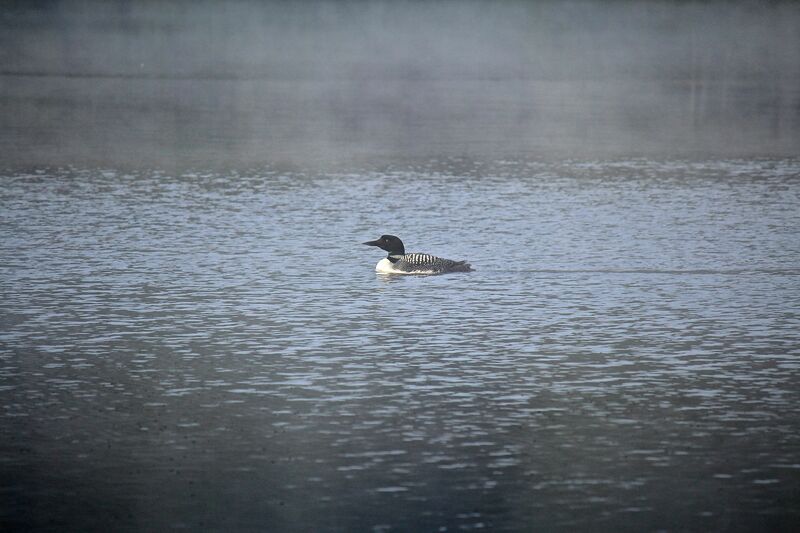 May be something to that–but how do you tell loons they’d be better waiting a week or two to nest. As I went through my photos from last summer, I found a few that I thought worth including. Four hours after the official count, it’s no longer raining and a loon has been fishing about a hundred yards from our dock. 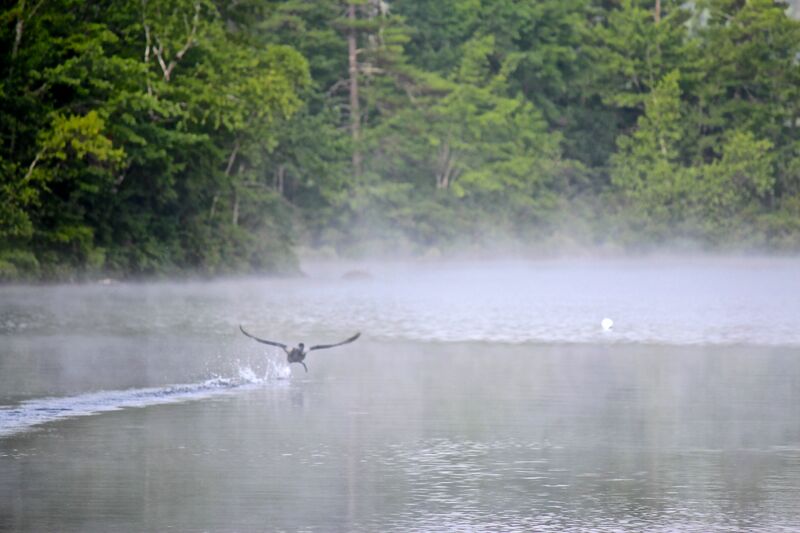 Maine Audubon offers the following tips to protect the loons. Education is the key. Two more glimpses from last year before I sign off. 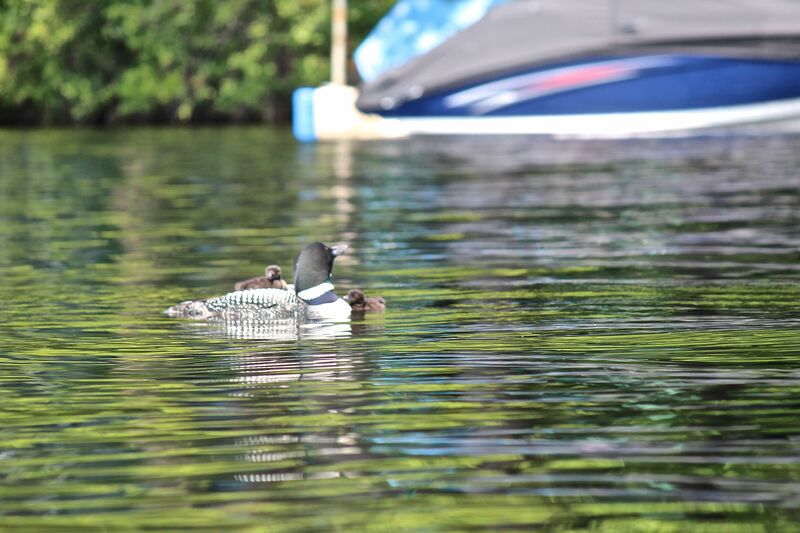 These were taken as my guy and I kayaked and the loon suddenly surfaced beside us. Always a thrill to see them and hear their looney tunes. Great. Please feel free to share it with anyone, Phil. 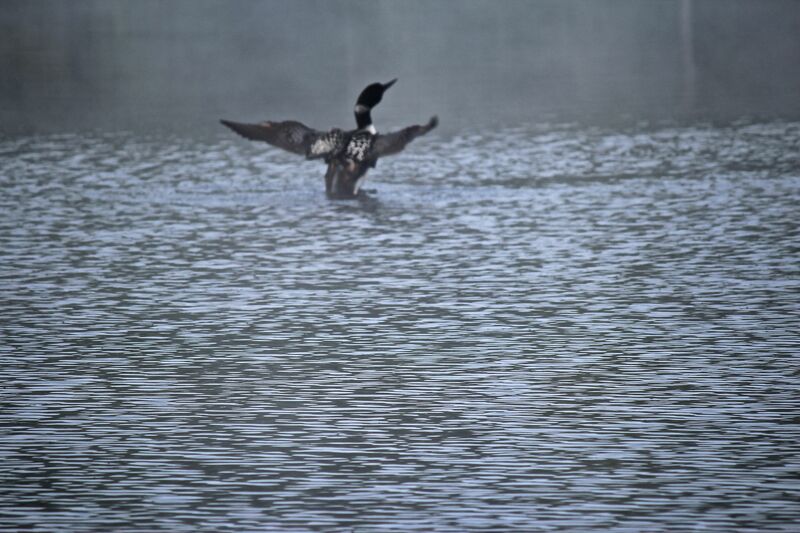 Those are beautiful loon pics from last year. On our way-too-small pond, wake board boats, jet skis, and circling power boats have pretty much eliminated any chance of chicks, although it seems a pair of loons tries each year. It is so sad, but what to do. The platform put out for the loons appears to be populated by turtles. Ack. Hey there! Thanks for admiring the photo. After being out in the rain yesterday, my camera quit. ARGH! Sorry to hear that the loons can’t start a family on your pond either. Interesting and makes sense about the turtles. Hmmmm . . .